A scandal over migrants being chased through the streets has exposed a rift between Angela Merkel and Germany's security establishment that is dividing her coalition and hindering efforts to contain the fall-out from her "open door" refugee policy. That put Maassen at odds with Merkel, who said the pictures "very clearly revealed hate" which could not be tolerated. "For a more decisive chancellor, this would have been enough to fire him," said Carsten Nickel at political consultancy Teneo Intelligence, adding that support for Maassen from Merkel's conservative Bavarian allies was staying her hand. "The migration issue will certainly continue to haunt Merkel until the end of her term," said Nickel. The Maassen row has its roots in Merkel's 2015 decision to open Germany's borders to refugees fleeing war in the Middle East. More than one million came in total. "Maassen is not an isolated case. Maassen is part of the security community," said Robin Alexander, author of "Die Getriebenen," or "Those Driven by Events," an account of how Merkel and her lieutenants handled the refugee crisis. "For this security community, autumn 2015 was a disaster - not just for Maassen, but for all of them," he added. "There is a deep alienation of the whole security community from the chancellor, and that was not the case in Germany previously." The rift opened up in October 2015, when Merkel put her chief of staff, Peter Altmaier, in charge of Germany's response to the refugee crisis, with Emily Haber - a diplomat - acting as point person in the Interior Ministry. That chain of command effectively shut out the security services, which couldn't get face time with Merkel. "That totally frustrated these people ... they were horrified," said Alexander. CSU leader Horst Seehofer, who had called Merkel's handling of the refugee crisis a "reign of injustice", was made interior minister. He gave Maassen political cover to push his security agenda, which he duly did. In an interview with Reuters in January, Maassen, 55, called for a review of laws restricting the surveillance of minors to guard against the children of extremist fighters returning to Germany as "sleeper agents" who could carry out attacks. "The bottom line is that he spoke before the agency finished its assessment," said one source familiar with the issue. But the letter failed to draw a line under a scandal that has also revived questions about Maassen's ties to the far-right AfD. A former leader of the AfD's youth wing, Franziska Schreiber, wrote in a book she published this year - "Inside AfD: The report of a drop-out" - that Maassen had advised ex-AfD leader Frauke Petry on how the party could avoid being put under surveillance by his agency. He has denied giving such counsel. 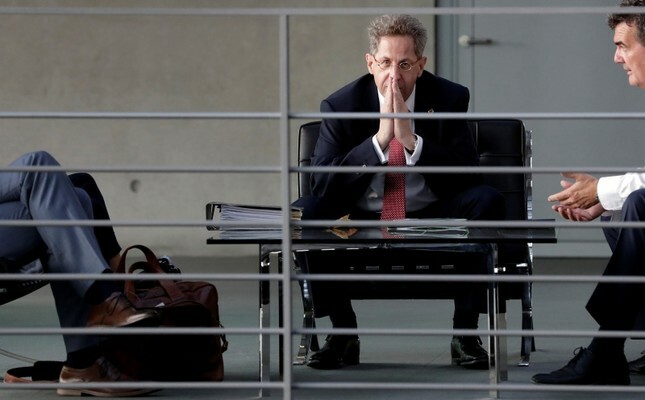 But Maassen has the backing of Seehofer, who said the intelligence chief "gave a convincing explanation of his actions" to a committee of lawmakers on Wednesday. However, the situation could be complicated by a meeting of the CSU on Saturday. If it supports Seehofer's decision to back Maassen and he does not quit, coalition leaders will be under pressure to take a decision on Tuesday.